Runcible labs, inventors and purveyors of fine quality technological oddities. Unique for the unique. Yodel-Ay-Hee-Moo is the world's first and only alpine cow timer. Everyone hates to wait, yet it seems we spend up to half our life doing it! Take some of the agony of waiting away by counting it down with Yodel-ay-hee-moo. 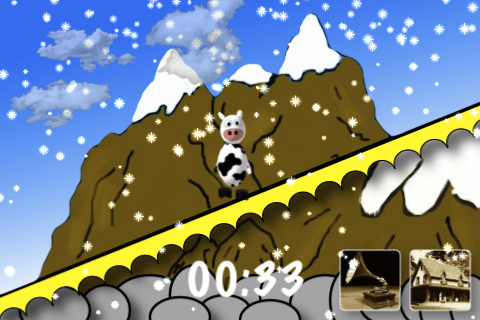 Just select your desired amount of time, sit back and be entertained as our lovely alpine cow shimmies up the mountain to a fantastic, uplifting yodeling tune (soundtrack can be turned on and off). Relax as the snowflakes fall and fluffy clouds drift by. You know your wait is over when you hear the “MOO alarm”-patent pending. After all, good things come to those who wait. Yodel-ay-hee-moo makes your wait time fun! © runcible labs, inc 2010. all rights reserved. design inspiration by free css templates.